Does it mean that the text books and notes will now be on tablets? Does it mean that the teaching will be by pre-recorded lessons? Does it mean that the learners can stay at home and participate in class remotely? We start off by bringing the majority of the material that the learners will use into digital format so that it can be searched and indexed quickly on their tablets, and one will no longer have to page through a collection of filed paper notes and old paper text books. The next step is to begin to use the tablet to do exercises and answer questions that the teacher asks, online. This begins to lead the learners away from passive learning where they are asked to memorise curriculum content, towards active learning, where they discover solutions and answers for themselves by leveraging online digital material. The teacher facilitates this discovery by means of guiding the learner through the process of discovery and exploration, in class (the teachers are still paid to work during the day, and not 24x7!). Once the learning content or topic is written and published, the learners and teachers can begin to use online discussion forums for addressing Frequently Asked Questions (FAQ’s) and debating the topic. The Western Cape Education Department (WCED) publish thousands of items of media supporting the different subjects, to which the school has access (but not the digitised curriculum itself – each school performs this task individually). These content items range from interesting songs to help remember the periodic table, to poems to help remember key components of a diagram or system, as well as detailed videos and explanations of various topics. Of course e-Learning requires increased self-discipline – learners have to understand that they are in the class to learn, and not allow themselves to be tempted away by the many other applications which may be installed on their device. This requires the development of a culture to support effective learning, which is framed in the Acceptable Use Policy which everyone signs each year. A key central feature of the e-Learning environment at Rhenish is Google Class – this is the central place where the teachers store the lessons and material for the learners, and where the learners upload and access material for learning, both during class, and afterwards. Google Class also contains links to interesting supporting material, which the learners can access in their own time. 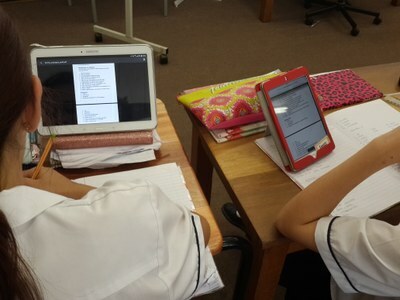 The teachers have to convert the whole curriculum over in modules, into digital media (this can take up to 2 years). Exercises have to be prepared digitally in advance, then shared to the learners according to the planned daily and weekly schedule. Once the WCED curriculum is converted into digital media online (learning is still passive at this stage), then the move can begin towards converting the teaching process in the classroom over into a more active learning model. With active learning, the teacher additionally plans a “journey of exploration for the learner”, which includes facilitating information, tests and hurdles that the learner must pass, before they can progress to the next stage. This means that interactive feedback and the ability to repeat topics must be possible. Typically this process will result in a learner who has better retention of the material studied, although it may not always result in them achieving better results. Good results come from exercising and applying what has been learned, to various problems, and asking questions if needed. The more this exercising is done, the better the learners’ understanding of the subject. It has now been three years since the first girls were allowed to bring their tablets to school and we can almost not remember a time without these ‘teaching/learning aids’. It is no longer strange to see Grade 8s practising for their Creative Arts performance with a tablet in hand or voting for the LC online. Technology is no longer something special, but rather part of our everyday life. Part of embracing technology is broadening the staff's horizons. We are happy to report that five of our teachers are now Google Certified Educators while a number of other teachers are busy with a variety of other courses on teaching with technology. Thanks to these courses teachers have been able to incorporate blogging, curating and other interesting new tasks into their repertoire.